A woman, who was arrested after a video claiming to depict animal cruelty offences went viral, has been charged. Lurgan PSNI charged the 34-year-old woman yesterday with animal cruelty offences. Police had received a report of animal cruelty on October 10 and immediately launched an investigation. 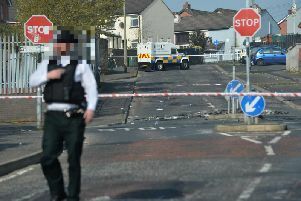 It followed a video circulating on social media claiming to depict an incident in the Union St/ Hill St area of Lurgan. She will appear at Craigavon Magistrates Court at a later date. It is understood that little Pixie is being cared for by a specialist in her breed. Indeed she was so popular at Lurgan PSNI station it is understood there were queues to have photos taken with her.